The second event concerning sharing economy was held in the capital of Poland. Interesting topics, speakers and conclusions after the event. The second local event of SHAREEN in Emilia-Romagna will be held during the national (un)conference "Espresso Coworking". Opportunities for European entrepreneurs in the sharing economy – a snapshot of the system. The workshop will provide Network advisers with more information about the sharing economy in Europe and explore how the Network can support this ‘new’ economic sector with its existing assets, tools and expertise. This workshop will take place during the Enterprise Europe Network Annual Conference 2018. Sharing Islands 2018, is an international conference on collaborative economy. It will take place in the islands of Gran Canaria and Tenerife for three days, with the participation of international experts who will tackle the issue of how to generate local productive ecosystems and move from competitive territories to collaborative territories. On the last day the speaker Cristóbal Gracia will hold a workshop that focuses on the design and development of ollaborative models through platforms. 28-30 November Gran Canaria & 28 November - 1 December Tenerife. 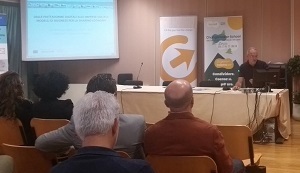 On 28 September, in the Press Room of the Congress Centre of the University of Calabria, an entire afternoon was dedicated to the workshop "From digital platforms to social enterprises: business models for sharing economy" with the contribution of regional and national operators, entrepreneurs and innovators. The meeting was organized by SPIN for the European project SharEEN (www.shareen.eu) in collaboration with Goodwill and Talent Garden Cosenza, with the aim of better understanding the needs of the initiatives already active in the region, extend and verify the first mapping made by the project and stimulate further for insights and collaborations.